Striking landscape trees even in winter, persimmons as fruit trees are both exotic and down-home. 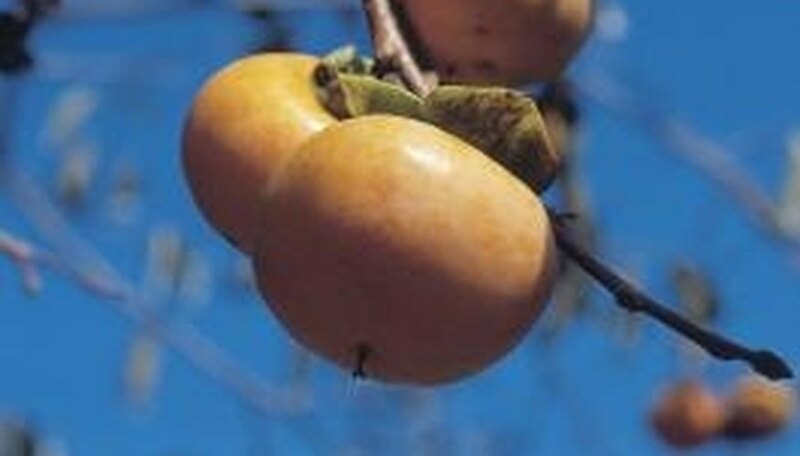 Most varieties home gardeners in the South and Southwest would plant are Asian persimmons (Diospyros kaki), which are self-pollinating, meaning they don't need other persimmon trees -- or varieties -- to produce fruit. But native persimmon varieties add an extra layer of complexity to the pollination question. American persimmons (D. virginiana) are dioecious -- meaning male and female flowers are produced on separate trees -- so to produce fruit, female trees need pollen from male trees. Frost does not help persimmons to ripen, contrary to common belief, and will actually ruin unripe fruit. Fortunately, persimmons continue to ripen after picking. Persimmon trees grow and produce best in full sun and good, loamy soil, though they tolerate poor soil. American persimmons and rootstocks better tolerate drought and wet conditions. American persimmon trees can reach 70 feet tall in the wild; Asian varieties are smaller trees and more compact. Persimmons don't need much pruning, but train trees to a modified central leader for best production, keep size convenient and remove damaged, dead and crossing branches. Fertilize young trees with a basic balanced fertilizer such as 10-10-10 for the first two years then switch to a low-nitrogen fertilizer such as 5-10-15. Native persimmon trees are quite hardy, and can survive winter temperatures of negative 20 to 25 degrees Fahrenheit -- offering gardeners in cold-winter climates a viable alternative to more vulnerable Asian persimmons. Eastern gardeners within the persimmon's natural range may be able plant female trees without a pollinator thanks to male trees in surrounding forest; sometimes small, seedless fruits are produced without pollination. American persimmon fruits are small but can be excellent. For good fruit quality Clemson University Extension recommends Early Golden, John Rick, Killen, Miller and Garretson. Temperatures below 10 degrees Fahrenheit will kill or seriously injure Asian persimmon varieties -- especially if the cold comes after a brief period of winter warming. Clemson recommends the cultivars Great Wall, Korean and Sheng as being most cold tolerant. Asian persimmons may produce both male and female flowers on the same tree, or perfect flowers -- those that have both male and female parts. The fact that Asian persimmons are self-pollinating means that if you just want one persimmon tree at home, that's all you have to plant. If you grow both Asian and American persimmon varieties, they won't cross-pollinate. American persimmon varieties are astringent, meaning that due to high tannin levels fruits need to be fully soft and ripe before eating. Asian persimmons are either astringent or non-astringent; non-astringent varieties such as Fuyu are often preferred. Fruits of non-astringent types can be eaten while quite firm and crisp, like apples. According to Just Fruits and Exotics, once fully ripened astringent varieties are "sweeter, richer and juicier," while the non-astringent types are crisp and mellow with flavor like sugarcane or cantaloupe. Do Persimmon Trees Need a Male & Female to Produce Fruit?